Having your Exchange mailbox data on a cloud platform like Office 365 has many advantages. Emails in Office 365 are universally accessible provided you have the net connectivity. So, many Exchange users like to keep a copy of their Exchange mailboxes on Office 365. To facilitate this easily, one can move their offline Outlook Data File (OST) to Office 365 accounts. And this can be done in many ways. Let us know some causes which tend users to move their OST files to Office 365 environment. How to import OST emails to Office 365? There are no direct methods to migrate OST emails to Office 365. However, you can convert OST files to PST format, and then upload them to Office 365. Also, there are many third party tools to help you save OST emails directly in Office 365 accounts. Convert OST file to PST format, and then upload to Office 365. Import OST files directly in Office 365 using third-party tools. It is an indirect method to export OST files to Office 365. First, convert OST files to PST format and then upload them to Office 365 accounts. Step 1: Convert the OST file into PST format. 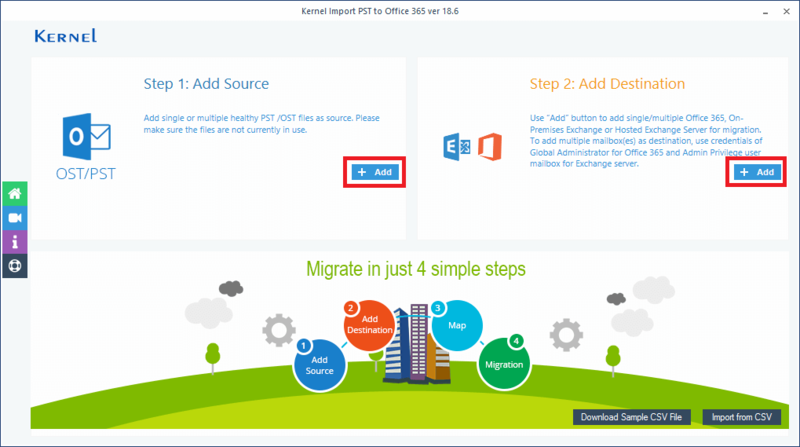 Step 2: Migrate the PST file to Office 365 environment. Both these steps can be performed in different ways. There are four different ways to convert OST file to the PST format. Create a new PST file and copy OST items in it. Use the archive feature of MS Outlook. Use the Export feature of MS Outlook. Use third-party OST to PST conversion tool. This method helps to move mailbox items to new PST file. Create a new PST file in Outlook. Copy data from the required mailbox folder and paste it into the PST file. Start the Outlook application and select File Cleanup tools Archive. Browse the destination where you want to save the file and click OK. Note: Entire mailbox items can be archived except Outlook Contacts. Start the Outlook application and go to the Export option from the File tab. Select the option Personal File Folder (PST) and click Next. Choose the folders you want to export (aslo check the box to include subfolders). Provide the saving location for the exported file. Click Finish to complete the process. Note: This method works only when the user account is connected to the Microsoft Exchange Server. After converting the OST file to PST, you can upload it to Office 365 in different ways. Upload to Office 365 using Azure AzCopy. Use Third-party OST to Office 365 migrator tool. You can directly upload the PST file to Office 365 using AzCopy. Download and install Azure AzCopy and copy the SAS (Shared Access Signature) URL (the SAS URL will provide the necessary permission to migrate the PST file to Azure). Upload the PST files to Office 365. Create the PST mapping (CSV) file. Create an import job in Office 365 to import PST file. Filter the data and initiate the PST import job. Drive shipping to Microsoft helps to import PST files to Office 365. Here, you just copy the PST files to a hard disk drive and send the drive to Microsoft. Microsoft will copy the data from the disk drive to the cloud. Importing OST files to Office 365 is not that easy. Novice and non-technical users find it a difficult task. That is why third-party tools are advised for direct OST file to Office 365 migration. Kernel Import OST to Office 365 is a useful tool for this. How to import OST files to Office 365 easily? Install Kernel Import OST to Office 365 tool and open it by double-clicking its icon. When you are on the home screen of the tool, add your OST file in the Add Source section and add Office 365 mailboxes in the Add Destination section. Select your Office 365 mailboxes to map them with OST files that are to be imported; then, click Set Filter and Migrate. 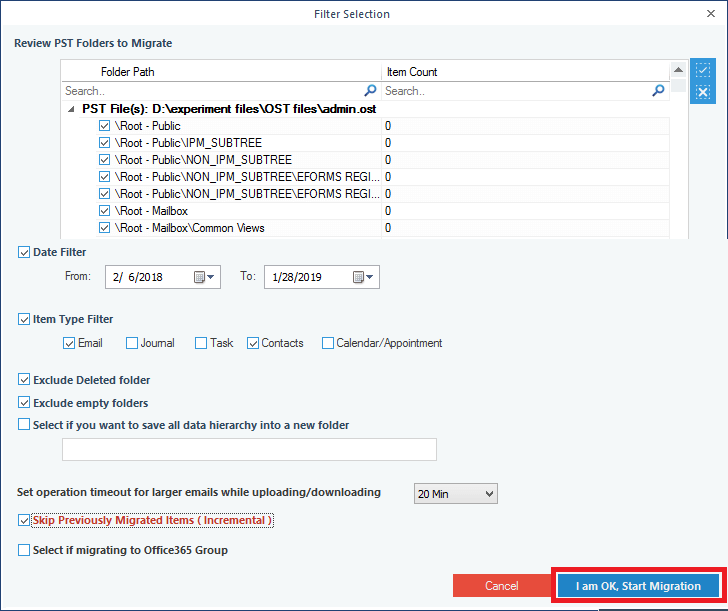 Now, apply filters to OST data by criteria like Review PST Folders to Migrate, Date filter, Item Type Filter, Exclude Deleted folder, Exclude empty folders, etc. and then click I am OK, Start Migration. 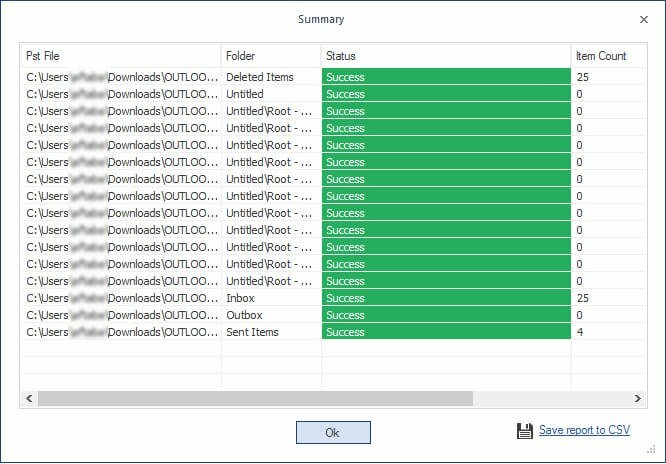 When your OST items are successfully migrated to Office 365 mailboxes, you will get a summary of the process (to save the summary, click Save report to CSV). 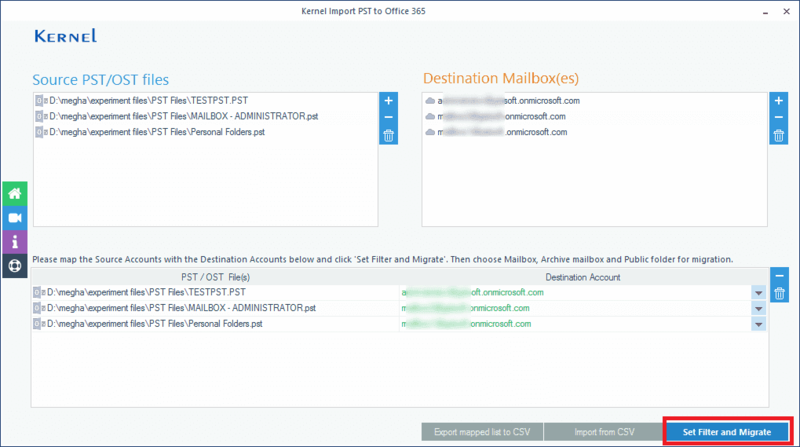 Summary: Kernel Import OST to Office 365 offers an easy way to import OST emails to Office 365. Both end users and administrators can use this tool to import OST files to Office 365 mailboxes.